I admit I am a bit of a travel gadget addict! The look on the poor security guards’s face at Heathrow when I got selected for extra screening going to the US said it all when she saw all my gadgets to test for explosives. 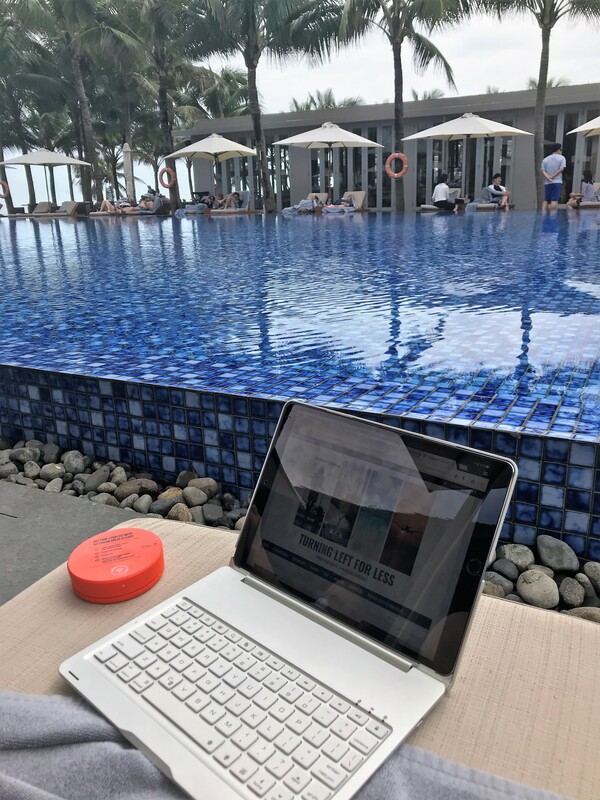 I have been trying out some new travel gadgets over the last few months so here is what I loved and what I didn’t. Although we all have smart phones with data and can now use our data free of charge in the EU, finding reliable Wi-Fi can be a challenge even in the fanciest hotels. In the US last year I struggled to get a decent Wi-Fi signal in several hotels which as a blogger is a major problem. So when I was offered the chance to try a Skyroam Solis I jumped at the chance. I thought I would give it a tougher challenge than the US and took it to Vietnam, Indonesia and a few remote corners of New Zealand. 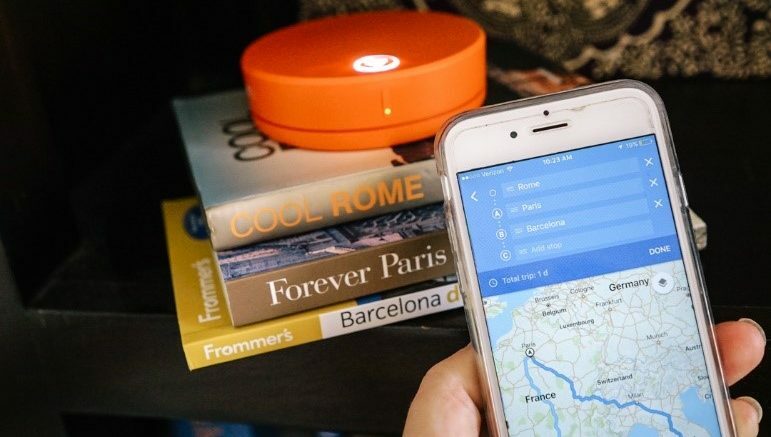 Skyroam Solis is a small portable 4G LTE dual Wi-Fi hub that does not incur roaming charges and works in over 120 countries. There’s not a huge amount of coverage in Africa and none in the UAE currently but other than that it covers most destinations I am likely to go to. You can also use it with up to 5 gadgets at once. However, it is not a cheap option at £127.99 So was it worth it? For me it was a big yes and it now accompanies me on every trip. It worked extremely well and I was able to get it to work everywhere I went. 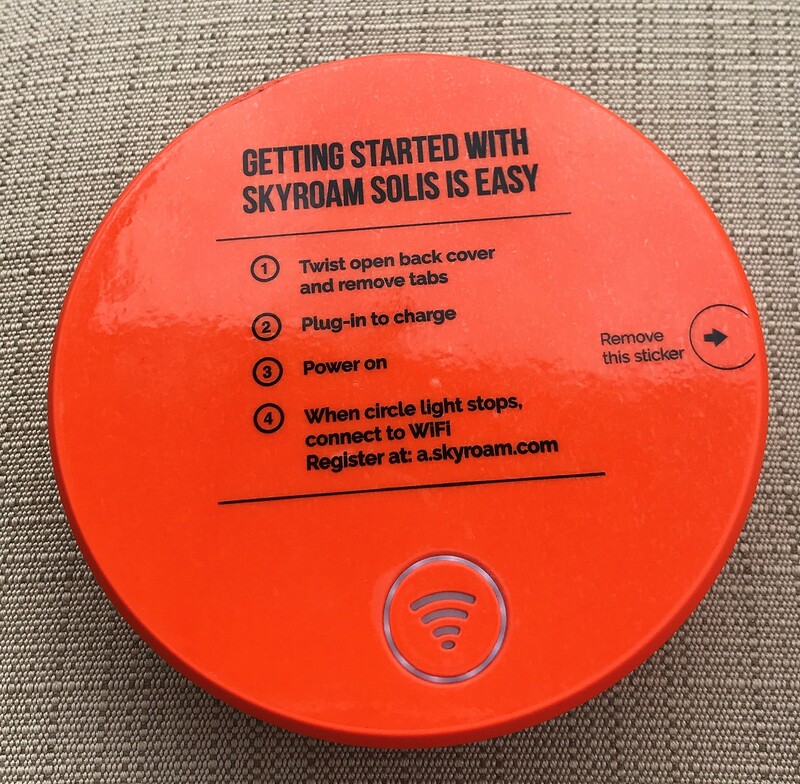 At times I could get no signal at all on my phone and the hotel Wi-Fi was patchy or slow but I was able get fast reliable Wi-Fi with the Skyroam Solis. Once you have bought the device you then can either use pay as you go at £7 a day or pay a monthly fee at £72 per month for a limited period. This will then rise to £88. There is no obligation to continue your monthly pass so you could just use it for heavy travel months and use pay as you go the rest of the time. For me pay as you go is perfect. Unlike most mobile networks the £9 is for unlimited data which makes it seem equal value to paying to use your phone data abroad since that is usually tied to your monthly limit. The fact that your travelling companions can also use it means that it works out better value than 2 people paying £5 each to their mobile network. The Skyroam is a great back up for me when the hotel Wi-Fi is unworkable as its so slow or I can’t use data on my phone. Although I have three mobile which includes a lot of countries free, there are still some major countries such as Canada where I have to pay to use data. The battery lasted a long time at around 16 hours so I didn’t have to charge it up more than once a trip. Once I had set it up it was very simple to use. Simply turn it on and connect like any Wi-Fi service and then just buy or activate your day pass and it was instantly available. I also liked that it was for 24 hours on a day pass. Some mobile networks rip you off with a £5 fee even if you only use the phone for a few hours since the charge is made every day at midnight. The Solis also can be used as a power bank to charge your devices so you don’t have to carry around a charger too. It was small enough for me to carry round in Vietnam so we could use data when we were out and about. It uses a future proof USB C connection and comes with a carrying case. If you are interested in buying one, you can get a special discount of 10% off when you use the coupon code TLFL18 on the Skyroam Solis website. You can find more information and use your discount code on Skyroam Solis website here. For any frequent traveller noise on flights is a major issue whether you are trying to work or sleep. If it’s not a crying baby, it’s someone snoring or on some airlines, people shouting into their mobiles as happened on Etihad in the First apartment. I already have my new Bose QC35 Wireless Noise Cancelling Headphones which I am loving. However, they are not great for sleeping in if you like to lie on your side. I had been looking for a solution other than foam earplugs and when I saw they had started noise cancelling earplugs I thought it had to be worth a go. I tested them both on a couple of flights and also at home when we were having building work being down and I was trying to work. The QuietOn ear plugs come with a USB charger and a carrying/charging case. I have to say I didn’t think these were worth the money at £149. They came with 2 sizes of silicone ear insert. I found that to get them into your ear with the correct seal was quite tricky and they were slightly less comfortable than foam earplugs. They play a sort of white noise but it is very low level. I thought they were slightly better than foam earplugs in terms of noise cancelling but I could still hear the builders. I tried sleeping on a flight with them and although much better than headphones the marginal improvement in noise cancellation didn’t warrant the less comfortable feel of them. The other disadvantage is having to charge them up and also not easily being able to tell what the battery level is other than dead or some level of charge. I do still use them to work in as they definitely reduce distractions more than foam ear plugs but I rarely bother to use them when I am travelling. The QuietOn Active Noise Cancelling Ear Plugs are available from Amazon. I suspect these will start to go down in price since they are a fairly new product to the market. If you are a regular reader you will know that I love wine (not in the being an alcholic sense I had better add!) and like to go wine tasting when I am on holiday. Ever since the liquids ban the issue has always been getting all that delicious wine that I have tasted in the vineyards back home in one piece. 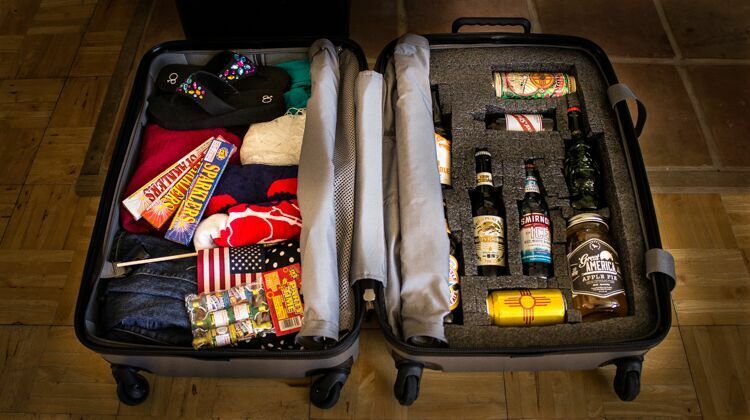 I recently discovered that such a thing as a wine suitcase actually exists. So I was delighted when VinGardeValise offered to let me try one of their suitcases for my New Zealand holiday. Roving Reporter and I visited two wine regions in New Zealand. The well known Marlborough region, home of Sauvignon Blanc and the lesser known Waiheke island off the coast of Auckland. Look out for my article on lesser known wine regions to visit in the next week. The VinGarde comes in 2 sizes so I decided to try out the larger size since we were, of course, flying in business class with Singapore Airlines (A350 review here). The larger size holds 12 bottles and still should weigh under 23kg when full. Obviously you still need to be under the customs limit of 4 litres per person or 5 bottles plus 250ml. Between us we had 10 bottles and 2 half bottle dessert wines. This weighed in at 20kg so well within normal limits. The suitcase was easy to manoeuvre as it has 4 spinner wheels, a telescopic soft grip handle and 2 sturdy handles on top and at the side. I thought it looked smart too. The VinGarde suitcases are very adaptable with their 2 bottle foam inserts. 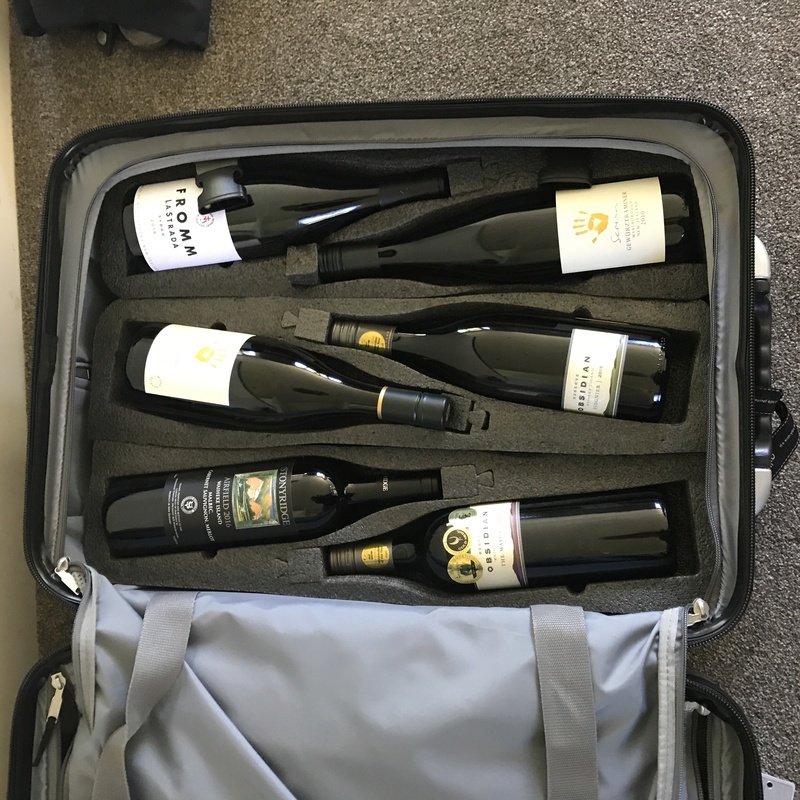 If you don’t want to use the whole case for wine you can take as many inserts out as you like and use the sections for clothes or other items. They also sell inserts separately for wine chilling, wine glasses, magnums and a customisable one so that you can fit things such as olive oil, spirits bottles and beers. The case has lots of foam padding, straps and zip compartments to ensure your wine arrives in tact. My wine survived its 10 flights (!) home in one piece which is pretty impressive given the number of flights. The odd bottle had moved slightly so next time I would probably pad out the smaller bottles with some bubble wrap but it was all still in perfect condition. The smaller size case could be used as hand luggage on some airlines depending on their rules and it holds up to 8 bottles. I thought is was a well made premium product that performed well and I will definitely be taking one on future wine tasting trips. 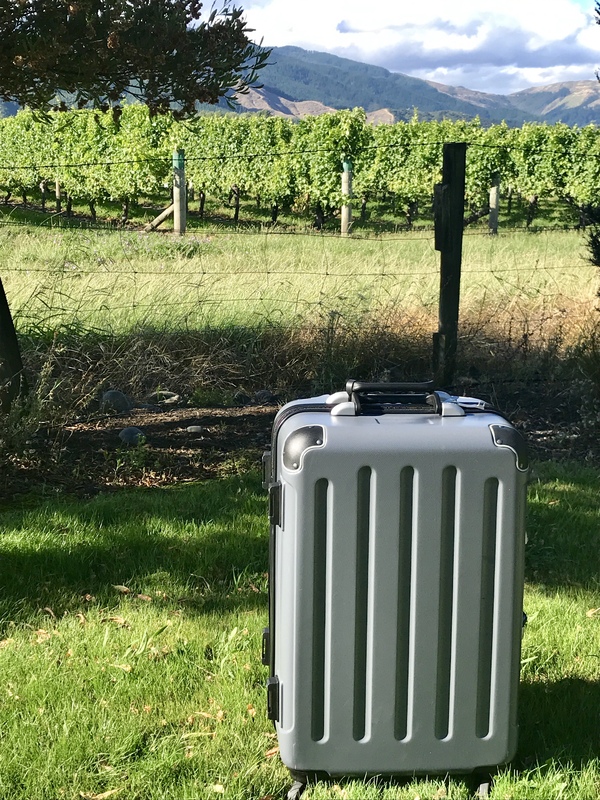 5 Comments on "3 travel products tried & tested – Skyroam Solis, VingardeValise wine suitcase & QuietOn earplugs"
I had a look into Skyroam before, and find it way too expensive. I’m a regular traveler and I find buying wifi dongle and then sticking a local sim with unlimited data is much more cheaper .For roughly £10 you can get wifi for the whole 2 weeks rather than just a day. A lot of airports sell the local sim cards at the arrival hall. I want to know who travels with sparklers and party poppers…. Its a very interesting idea. In the big case, you can put 6 in each side. Is there foam to go into the middle to stop the bottles knocking together or just the thin skirt like most suitcases? Does it feel that it is just a bought suitcase that someone has put in foam and sold on, or is it worth the money and feel like something actually made for this purpose? It has foam inserts that go on top of each side and also in the middle plus double straps each side and a zipped fabric closure for each side. It definitely feels like they have made this specially compared to the other one I have seen that looks very flimsy.